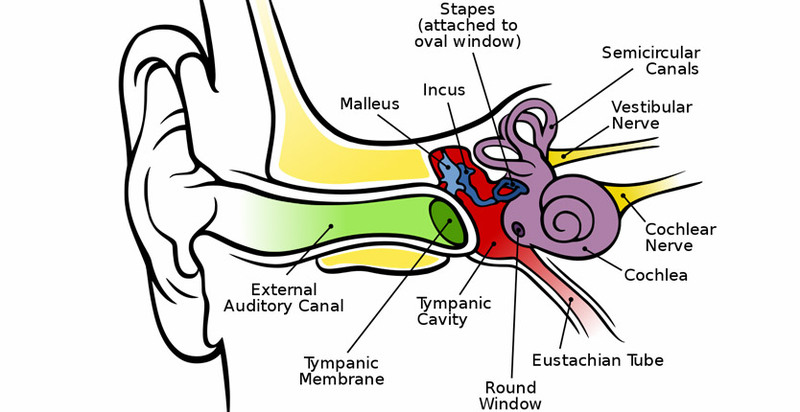 The are various components of the Auricle, which should be located using an anatomy atlas. Located in the Petrous part of the temporal bone, it is an extremely difficult structure to visualize. As I mentioned before, the best way to understand the middle ear is by envisioning it to be an empty box. If you have followed correctly you should be able to deduce the lateral border of the Middle ear…. lies, (the Carotid wall separates the artery from the middle ear space). Jugular wall where the jugular vein lies. structure is divided into four quadrants, Anterior Inferior, Posterior Inferior. The Anterior Inferior Region reflects light thus it is referred to as the cone of light. The Corda Timpani crosses the manubrium of the Mallus. The epitympanic recess is the space between the mallus and the Incus , and is continuous with the mastoid air cells posterior. The facial nerve transverses the facial canal and enters the posterior wall where it gives of several branches. ( It lies above the oval window ) and exits the Middle ear through the Stylomastoid foramen. The venous plexus is formed from branches of the tympanic membrane, The lesser petrosal is one such branch that exits through the hiatus for the lesser petrousal And it will inervate the parotid gland. Has an opening which leads into the eustacian tube and this provides a connection between the ear and the nasopharynx. The tensor tympani which is inervated by V-3 lies in this area. The stapedus muscle comes of the posterior wall which contains the facial nerve The nerves that come of the facial nerve in this region are the Nerve to stapidus and the chorda tympani. These help convey sound from the tympanic Membrane to the oval window. The Inner mucous lining of the Middle ear is inervated by Glosopyrangial where as the outer lining (external ear is innervated by branches of trigeminal. With in the inner ear lies the Vestibular System made up of the semicervular canals and the Auditory System, ( The Cochlea). The membranous Labyrinth is separated from the bony labyrinth by the a fluid called perilymph.